Not all resorts and villas are the same - one major factor is their location. 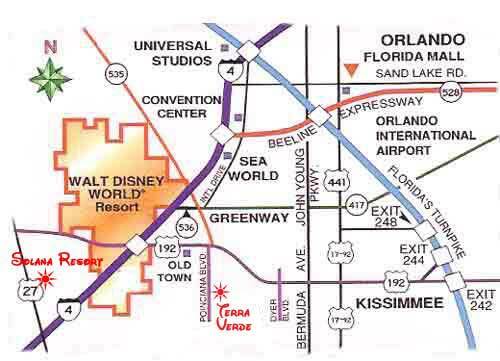 Terra Verde Resort and Solana Resort are both rare new resorts close to Disney and all the other Orlando area attractions. Both are well within the so-called 'Golden Triangle' of driving times to all the attractions. 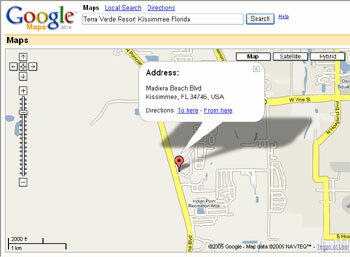 Seaworld and Universal amongst others are also just a short drive away. Convenient too for shopping including the factory outlets like Premium Outlets and superb Florida and Millenia Malls it is going to be difficult to fit everything into a single vacation! For added convenience both resorts are only a short drive from 'Super Wal*Marts' and Publix Supermarkets for groceries and about everything else you could want. The coast is within easy reach and only about an hour away. On the Gulf side are the fantastic beaches and attractions like Busch Gardens, on the Atlantic coast is the famous Cocoa Beach and the Kennedy Space Center at Cape Canaveral. As well as the Shuttle, which have a busy launch schedule for the next two years, the Air Force still has an active launch program of Atlas rockets - a night launch is particularly spectacular (to view upcoming launch schedules click here). Port Canaveral is also home to Caribbean cruises if you are planning a two centre vacation. A little further up the coast is Daytona home of the famous race track. There are numerous fantastic golf courses within easy reach of both resorts and if you just prefer the odd game and don't want to take your own clubs on vacation, we even provide two sets of clubs for your use at Sunshine and Sundance Villas and a single set at Sunbeam Villa. Some of the most renowned courses in Florida are a short drive from Solana Resort and you will often see the PGA golfers playing here. Disney is clearly one of the most popular destinations for many visitors to the Orlando area, and we have to admit that we love spending the day there too! Even although Alex our son was only 7 months old on his first visit his face was a picture of joy and he got so much attention form all the characters. From Terra Verde - Head north on Poinciana Boulevard and either take the 192 west, or carry over and use the Osceola Parkway. Then you just need to follow the signs and we have timed it ourselves from Terra Verde to the welcome to Disney archway as a 10 minute drive. 1) There is the simpler right turn from the end of the resort road onto Hwy 27 and head north to take the 192 Eastbound. This will pass Orange Lakes and then shortly after you will see the signs to Disney, just before you reach the intersection with the I4. 2) You can also take a left onto the 27 and head south to get to the I4. Head East on the I4 and you will soon see the signs to Disney. Within a minute or twos drive are all your favorite restaurants including The Olive Garden, Macaroni Grill, Chilis, The Outback Steakhouse, Uno's, and not forgetting Denney's and IHOP for breakfast or your good old diner fare. Our personal favorite is the Cheesecake Factory at Millenia Mall which is only about 15-20 minutes away - you have to remember to leave room for the Lemon Raspberry though! Nearby is Krispy Kreme, one of the worlds fastest growing chains - you have to watch how they make the donuts even if you can resist the temptation. For added convenience we are only a mile or so from 'Super Wal-Mart' for groceries and about everything else you could want. There is also a brand new Super Target just along the 192 - about 5 minutes away from Sunshine Villa. 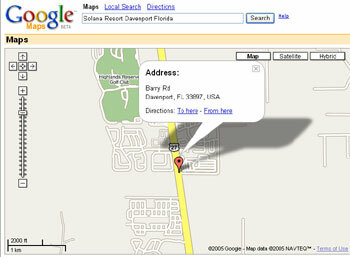 Solana Resort is located just to the West of Disney, just off of Highway 27 between the I4 and Hwy192. This makes it ideally placed for access to the main roads to any of Central Florida's attractions from the Gulf Coast to the Space Coast, and of course the Theme Parks. For added convenience we are only a few miles from the areas newest 'Super Wal-Marts' for groceries and about everything else you could want. They even have an 'International Foods Aisle' selling all the British favorites from Branston Pickle to Heinz Baked Beans in tomato sauce!